Ethical Shop Cruelty-free goods, including vegan chocolates, cosmetics and toiletries. 10% members’ discount. We provide a wide range of free education resources on animal issues for citizenship, PSHE, RE, food technology, English, general studies and history at KS3, KS4 and sixth form. Our volunteer speakers are available to give free school talks to students from KS1 to sixth form. We have a wide range of free resources including DVDs, student activities (lesson plans and worksheets), student factsheets and information booklets, campaign leaflets and posters. Browse our selection of resources on the TES website. 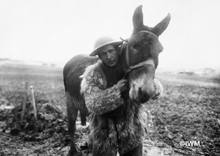 To coincide with the Centenary of the First World War, Animal Aid has produced a set of free teaching resources for English on the role played by animals in the conflict. Please email education@animalaid.co.uk or call 01732 364546 ext. 234, if you have any queries. Contact Animal Aid at The Old Chapel, Bradford Street, Tonbridge, Kent, TN9 1AW, UK, tel +44 (0)1732 364546, fax +44 (0)1732 366533, email info@animalaid.org.uk.